Aloha Plus Storage & Packaging provides essential storage unit services, packaging and shipping for all of your private or business storage and transition needs. Located in Kailua-Kona, Aloha Plus Storage & Packaging provides businesses and individuals with a conveniently located facility that will make everything about your moving and storage convenient, fast and efficient. The next time you embark on a move you will able to relax knowing that your possessions are in good hands. Take all that stress out of moving with these professionals and just imagine how much better you will feel! Shipping made easy with UPS, Fed Ex and many other postal services are crucial to a smooth and efficient business operation or relocation. With Aloha Plus Storage & Packaging, you can take advantage of their mailbox and notary services at the business center, which also offers printing, faxing and lamination. If you need a one-stop center that handles all your mailing and storage needs with a demonstrated commitment to excellence, these professionals consistently deliver on-time and hassle-free services when you can’t be around to supervise the process. Having secure access to a storage unit makes a world of difference to busy professionals who have to manage their operations around the globe. With Aloha Plus Storage & Packaging their product is delivered with your busy schedule in mind. All you have to do is focus on your travel and business while they take care of your posessions, packages and mailbox deliveries. 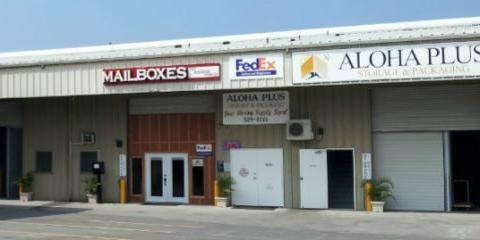 If you are interested in taking advantage of Aloha Plus Storage & Packaging products for stress-free storage and shipping services, contact one of their storage and shipping consultants by calling (808) 329-2121 or to view their many other products and services visit Aloha Plus Storage & Packaging online.